Thanks to everyone for all the support! I finally got some work done on the first cinematic. Scene 6 (out of 7) has been completed and I'm currently working on the terraining and triggering for the final scene. So far I'm planning on just releasing everything at the same time, the assets included as part of the mod. Frustrated with the editor and would like answers in real time? 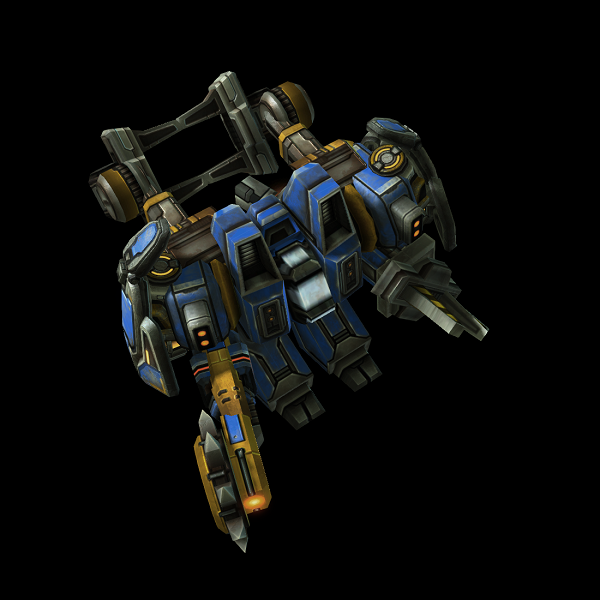 Join the SC2Mapster Discord! There is no music. I couldn't find any music in the game files that could capture the atmosphere I intended to convey. I realize that as a result the cinematic is a lot less immersive and lacks the life which music would have brought to it. If anyone has any ideas I'm open to suggestions. It's over 12 minutes long. The script I originally wrote contained dialogue for roughly 5 minutes runtime, but I ended up adding so much to it that it ended up being quite long. I apologize if it's too much of a drag to watch. 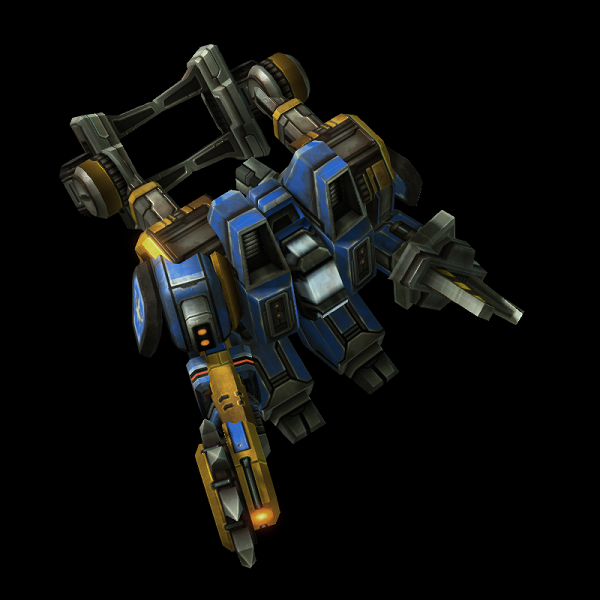 Credit to the creators of the Starcraft: Mass Recall mod for the dropship models (I had to modify them a little since some animations were bugged). Wow. Definitely one of the if not the best cinematic I've seen. Love those custom models, writing was very good, there was great action, characters had distinct personalities, even the dominion was on spot. The only problem I had was that some of the dialog lines were played too fast. But apart from that you did a great job. If your campaign only has half of the quality of this cinematic then it will be among the best ones on mapster. How!!!??? Nicely done!! You are rivaling the god of the CCI - Evindl. Lol @the moment with grenade. Very cool. Wow that was an awesome cinematic. Wasn't bored at all watching it. It is on the long side for a cinematic, but the amount of action and stuff going on makes it seem shorter than it actually is. Great work! I think you will definitely need at least two different tracks considering the length of the cinematic. Someone help ZergBaneling choose some quality music! Alright, ready up your eyeballs, because there's A LOT to be said with this one. For starters, the production value is really high with this one. This does reek (In a good way, I mean) of actual effort put in a whole lot of elements beyond custom models, and in that I mean the story, presentation, some of the action, particularly the final scene with the Dropships. The only thing missing from all of this, and which could be done with some careful selection, is truly some music, to set the pace of epicness you're likely aiming to achieve. It seems at least some of the characters introduced seem to set their personalities - one's a gifted in denial, the other's a detective, another is a war veteran, the jet pack one is easily happy-go-lucky, though I feel some others like the sniper could've used some extra time. The only nitpicks I have here, besides the lack of voice acting and some fidgets going a bit slow, is that some of the dialog feels a bit too rushed, as I had to pause at times to read some of those lines. Besides, the Protoss' monlogue mixed with the action detracted a bit, IMO, the introduction which seemed to hit most finer points and wasn't quite that much. Also, since it wasn't much told about this Protoss character, it'd be a lot more better if he were introduced as a surprise - picture Alarak in Nova: Covert Ops, which literally NO ONE was seeing it coming. The Light will blind you. Step away from it!!! Regarding the speed of the text: the reason it's fast is because whenever I encounter transmissions in other campaigns, they've seemed too long for me. Whenever I watch Jayborino's playthroughs, typically he reads them and there is a long pause between sentences, which to me slightly puts off the immersion of it all. That said, I understand there are only so many things you can do when you don't have the luxury of voice acting. I will try to find places where the transmissions seem short and lengthen them a bit. My trick to getting cutscenes to flow quickly in StarCraft I was to read the lines aloud in the voice and mannerism I imagine the character to have, timing each line while I do so with a stopwatch, and then adding 0.25-0.5 seconds on the transmission time for good measure. Going back to read the cutscenes after I do that tends to result in an easy, smooth read with little long pauses. Granted, some people are very slow readers, but you can't accommodate everyone, so it's best to aim for the majority rather than the slim minority of slow readers. I talk pretty fast, and think that's an okay baseline to use for text speed as everyone else would be reading in their head. I didn't have any issue with the text flow personally, but, then again, it's based off of my personal reading speed haha. Ultimately, it's always going to be a bit unnatural because viewing dialogue alongside a watchable cinematic won't come across like a normal, audible conversation. It's certainly a struggle as some are slow readers and/or non-native English speakers/readers so there's no way to accommodate for everyone. There's a suspension of disbelief that goes along with a lack of voice acting - and voice acting is a rare beast these days because of the cost of finding actual talent. I don't expect anyone to utilize voice acting and, if they do, it's an added perk, not a baseline most should be expected to follow. 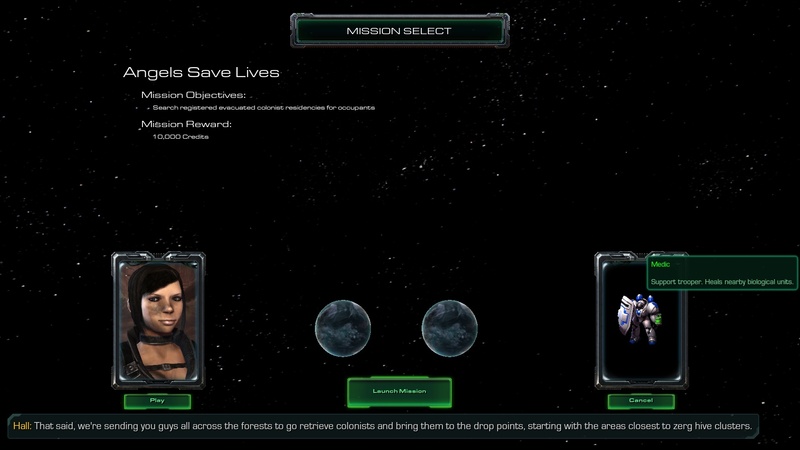 Small update: I changed the mission select panel. It used to be that the planets were just portrait models and they had buttons under them; I wanted for the player to be able to highlight and click on the planets themselves. It still looks quite dull in comparison to the workshop panel, so any suggestions to pretty it up would be appreciated! Hello all! I apologize that there haven't been any updates for a long while now. Unfortunately, I have been unable to use the editor or even launch Starcraft II at all due to authentication errors I've been having with the account I'm using. Hopefully this will be resolved soon. However, this does give an opportunity for more brainstorming. The issue with login authentication has been resolved. It's about time there's been an update, huh? I ended up completely scrapping the original version of the mission "Shoot, Steal, Sprint" (tbriggs01) and a new version from scratch is in progress. I am currently working on remaking some of the data edits I've done in tbriggs01 and implementing them into the dependency mod for potential future use (namely several reworked versions of the Umojan Lab Door units). Unfortunately I have to recreate them from square one since I can't just copy the XML data; I was too lazy to create duplicates of the units in the map and edited the existing ones instead, and I would like to avoid having edited content in the mod. I wanted a data solution to automate the doors so that I won't have to create a trigger for every single door. In addition, the ones in the vanilla mod have footprints that don't line up with the cliffs in the desired proportions, so these new ones fit a lot more cleanly for the way the map is being designed. Nice to hear that you can make progress again. Cant view the automatic door gif though, somehow photobucket wont work for me. Yeah, Photobucket is "down for maintenance" at the moment. It's been like that for longer than I'd expected though; they said it would take from around 10 PM to 2 AM MST. Thankfully for me it's just a minor inconvenience, as opposed to the case for some who run websites and such reliant on Photobucket services. EDIT: It should be working now. Modified worker unit suited for planetary settlement. Can gather minerals at a greater rate than regular SCVs. 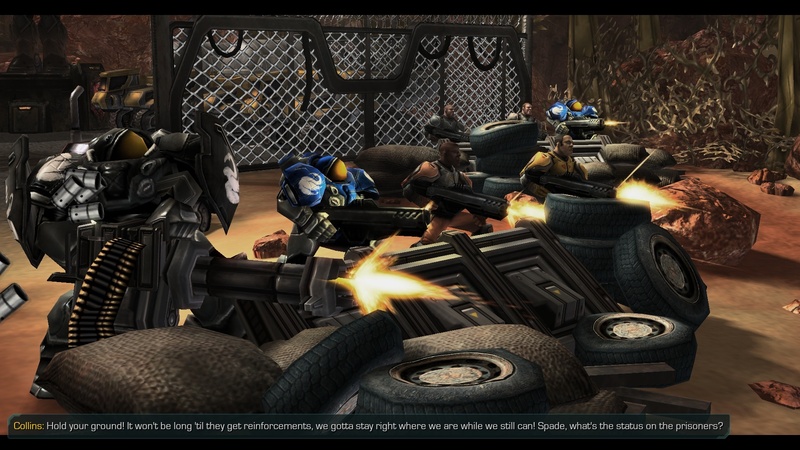 The use of the SCV in hotly contested battlezones is unparalleled amidst the hardy technologies of the Terrans in its utility and versatility, able to harvest raw tactical resources such as minerals and vespene gas, critical to assembly and maintenance of the Terran army, in addition to its repair and construction capabilities. However, the need to materialize such machines of war is scarce on more peaceful worlds such as Agria whose primary concerns as newly settled worlds are to simply sustain their populations. Thus, the concept of the PTV (Planetary Terraforming Vehicle) was developed to support the needs of non-militarized fringe world colonies. These hardy vehicles are bulkier and slower than battlefield-deployed SCVs but can sustain greater loads with ease both with a standardized clamp arm and back mounted frame. The PTV servos are interchangeable with any servos compatible with the SCV, though SCVs lack the programming and mounting requirements for the massive variety of harvesting, construction, and farming tools, often times self-made by the colonists themselves, that can be equipped on the PTV. PTVs are also designed to be more well suited for combat situations than SCVs, as fringe world colonists typically defend for themselves in lieu of expensive military security forces. Based on older SCV models, which had additional reinforced plating, the PTV boasts sustainable protection from direct dynamite blasts from mining and other punishment that would otherwise leave the fragile SCV destroyed or damaged beyond repair. However, weaponry is generally limited to the equipped utility, as colonists typically settle in scarcely hostile environments where indigenous creatures are the only potential threat to security. I think he means that PTVs are deployed in minorly hostile worlds rather than actual theatres of war. They seem to be more slightly general purpose in contrast to the more specialized SCV. The sturdier plating might mean it will be more costly to deploy, but offset with the minor combat abilities it provides. I've changed the model a bit and added animations (Cover Start/Cover End) for it based on the abilities for the PTV in the mission "Shoot, Steal, Sprint" (tbriggs01). The basic mechanic of tbriggs01 is a pickup/drop-off system, where you will be gathering supply crates and depositing them at designated locations. I just thought it would be a nice touch to add the animations. Is that one backpad clipping through the right shoulder or is that just the perspective? Yeah, it's clipping. I'm just a kitbasher, and personally I don't think it looks as odd visually from the distance you'll typically be viewing it from. I'm a little confused by one thing: You first stated that the PTV is made as a more peace-fitted version of the SCV, but in the last part you declare it to be more combat suited. Is the PTV now a better option in general combat than the SCV? Or just in specific situations? Sorry it's a bit confusing; Alevice pretty much summed it up. SCVs are faster due to the need to be quickly dispatched for repairs and rapid resource gathering on the battlefield. SCVs aren't as designed to protect the driver as PTVs. The resulting bulk from additional protective plating on PTVs makes them slower and can carry larger tools such as the Hypersaw, typically used for gathering lumber and mining but is also superior option in combat situations to the Fusion Cutter. The PTV isn't designed for "peace", but rather settlement, which could involve protection from indigenous species or small rival factions/raiders, etc. You definitely wouldn't want to make an army of these, though. In tbriggs01, you will be using your PTVs in combat instead of keeping them in the back like you might with SCvs, as they are not as fragile nor DPS-deficient as SCVs.